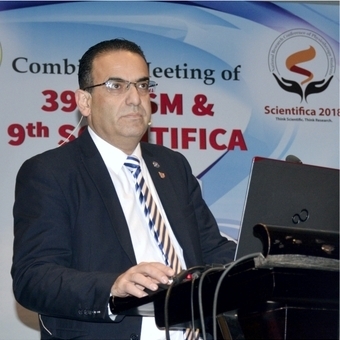 Professor Rami Abboud, Associate Dean for Learning and Teaching and Head of Postgraduate Division, School of Medicine, was invited as Chief Faculty of the Indian Association of Sports Medicine (IASM) and one of three international keynote speakers to the Combined Meeting of the 39th IASM & 9th Scientifica, which took place in Sheraton Grand, Pune between 2-4 February 2018. The other two international keynote speakers were Professor Mohit Bhandari (McMaster University, Canada) and Professor Patrick Yung (Chinese University of Hong Kong). The President of IASM, Dr Parag Sancheti, and the Sancheti Institute for Orthopaedics & Rehabilitation (SIOR) hosted and powered the combined meeting, which attracted over 350 delegates and was complimented by 30 national eminent faculty members including the founder of the society in 1971 Dr Jaspal Singh Sandhu, many past presidents of the society, and one of our Dundee MCh Orth graduates, Dr Ketan Khurjekar (Class of 2006), who is currently the Head of Spine Surgery Department at SIOR. The combined meeting commenced with a workshop day on the 2nd of February with three workshops delivered concurrently in the morning and three in the afternoon. The Institute of Motion Analysis & Research (IMAR) at the University of Dundee, represented by Professor Rami Abboud, Dr Graham Arnold and Mr Sadiq Nasir, delivered a breath-taking workshop on how to set up a gait analysis laboratory, why we need a gait analysis laboratory, marker placement and data capture. The workshop was so popular that it was oversubscribed by delegates eager to attend and was attended by nearly a 100 delegates. The workshop was delivered ‘virtually’ as gait equipment was difficult to get into India. The delegates were impressed by the outstanding delivery by Graham and Sadiq as they actually felt there were real cameras and force plates in the auditorium due to the exceptional attention to detail and synchronous movements on stage and during the power point presentation. The workshop was extremely well received and fostered tremendous feedback and enthusiastic interaction from delegates. Left: Mr Sadiq Nasir, Dr Graham Arnold and Professor Rami Abboud doing the gait analysis workshop; Right: Graham complete with retro-reflective markers whilst Sadiq highlights the captured motion on screen. The two day conference on the 3rd and 4th February was full of mind-challenging presentations and five keynote lectures delivered by Professor Sancheti, Professor Yung, Professor Bhandari, Professor Abboud and Dr Irani. Professor Abboud’s keynote focussed on “Biomechanics in sports or vice-versa” followed by another lecture on “Cricket, bowlers and landing: good, bad and ugly” with the workshop on the previous day paving the understanding of the power of clinical gait analysis and its role in helping athletes enhance their performance whilst at the same time prevent injury. Following the inauguration ceremony on Saturday afternoon, the delegates were treated to an exceptional dance and fashion show by the physiotherapy students and the faculty of the Sancheti Health Academy, which is associated with the College of Physiotherapy of Maharashtra University of Health Sciences. Professor Abboud delivering his keynote lecture. Left: Dr Vivek Kulkarni (Course Co-organiser and Principal of the College of Physiotherapy), Dr Parag Sancheti (Organising Chairman & IASM President) and Professor Abboud; Right: Interested physiotherapists at the University of Dundee information stand. “It was a great privilege to be invited by the President of IASM for the third year running to attend this prestigious sports conference and for the second year running to be invited as the Chief Faculty. In his second and last year as President of IASM, Dr Parag Sancheti, who is one of our MCh (Orth) graduates from 2003, managed to assemble a distinguished programme of national and international speakers that was commended by the IASM committee, past presidents and the founder to be the best IASM meeting so far” said Professor Abboud. “Although this was a very tiring trip (a long weekend in India! ), it was extremely successful and rewarding with both lectures and the workshop being extremely well received. The hospitality by Dr Sancheti and the organising IASM committee was nothing but excellent, paying great attention to all minor details to make our journey as worthwhile as possible. What impressed me most was the delegates and their inquisitive minds asking difficult and intelligent questions of every aspect of the lectures delivered at the conference. We were not given a minute to breathe at coffee and lunch breaks or even at the Gala dinner where we were quizzed about every aspect of sport and biomechanics. Their energy, commitment and enthusiasm until the last minute of the conference on Sunday night were breath-taking. If this is a sample of the new generation of sports clinicians, researchers and scholars then the future is looking bright indeed” added Professor Abboud. “It was also heartening to meet two of our MCh (Orth) graduates and hear about their successes, Dr Ashish Arbat and Dr Arun Ramanathan, with one of them, Arun, making the journey from Chennai to Pune; a round-trip of over 2000km”. “We conduct regular cutting-edge sports-related research studies each year at IMAR on our various undergraduate and postgraduate degrees including our Master’s degree MRes in Sports Biomechanics & Rehabilitation and MSc in Motion Analysis”. Organisers, Faculty and Delegates on another successful IASM. Conducting and publishing research and in organizing seminars, symposiums and workshops related to Sports Medicine & allied Sciences. Establishing Sports Medicine Centers or institutes in various states. Sports medicine involves sports scientists specialized in Sports Physiotherapy, Sports Psychology, Sports Nutrition, Sports Biomechanics, Training Methods, Rehabilitation and research to provide scientific input in offering valuable service to the elite and budding sports persons. “Knowledge is useful when you put it into practice” hence Sports medicine makes an effort of theoretically and practically analyzing the influence of the movement and training of sports which is useful in prevention, therapy and rehabilitation. Sancheti Hospital is a 200 bedded Hospital started since 1965 and Sancheti Institute of College of Physiotherapy was started in 1995.